It’s fall, I’m feeling better and finally on the mend from the nasty cold I had last week, and knock on wood I think the morning (all day) sickness has finally past. I’ve been ready for that and veggies since the first trimester ended. This means the return of buddha bowls and big salads. Sharing with you today Anti-Inflammatory Buddha Bowls 2.0, a variation of my Anti-Inflammatory Buddha Bowl which one of the top viewed recipes on the blog. If you follow me on Instagram you will know I’m all about apples right now and can’t get enough. Yesterday was one of my favorite days of the year, our annual trip to the apple orchard with friends to pick apples. We picked a bushel of mixed apples plus a basket of Honeycrisp. Next weekend a friend and I are headed to the Cranberry Festival in Wisconsin! Last year we did a girls trip there, this year we’re taking our daughters (minus S because she has Homecoming). I just recently learned the skin on apples contains anthocyanins, antioxidants that reduce inflammatory responses. 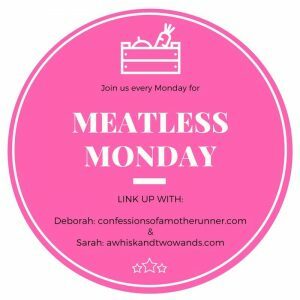 Not that I needed a reason to eat more or add them to a buddha bowl! I kept many things the same as my original Anti-Inflammatory Buddha Bowl but also made a couple swaps an additions. 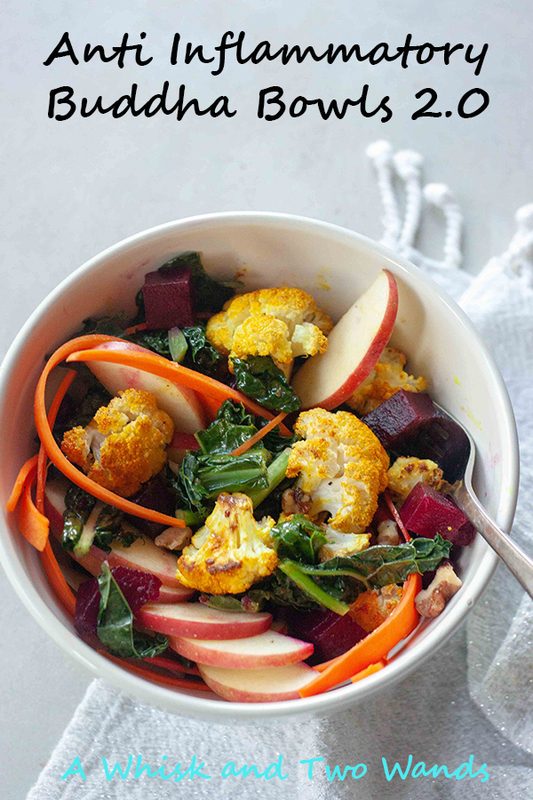 I kept my favorite turmeric roasted cauliflower, beets, and walnuts. I swapped the blueberries for dried cranberries. I omitted the avocados and added apples and carrots. For dressing it all depends on my mood. I either omit it, add a drizzle of balsamic, the Turmeric Dressing from my Anti-Inflammatory Salad, or use a Lemon Turmeric Vinaigrette I recently found at Whole Foods. I broke down the anti inflammatory foods in my Anti- Inflammatory Buddha Bowl but realized I didn’t include olive oil or garlic. So here is the breakdown from the original post for the foods used in this bowl along with the additions and 2 I forgot. 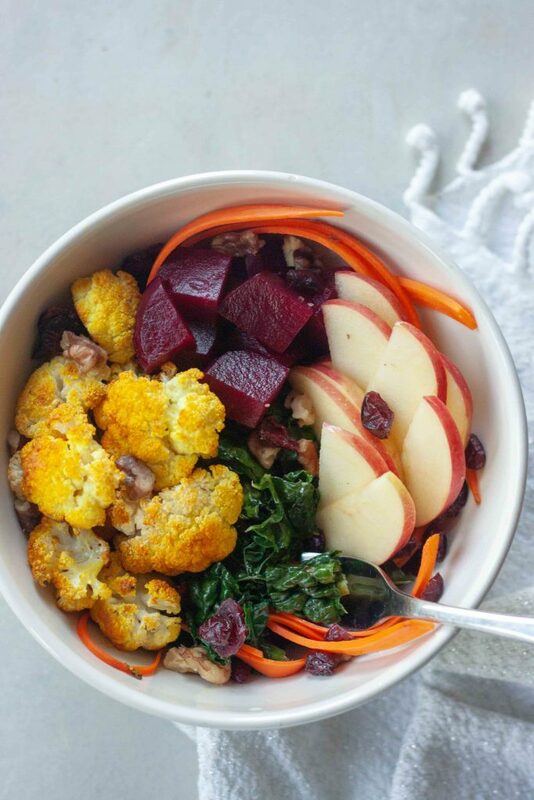 Eating cauliflower is like winning the antioxidant and phytonutrient lottery, packed with vitamin C, beta-carotene, kaempferol, quercetin, rutin, cinnamic acid, and much more. Turmeric is one of the hottest and trendiest superfoods right now and for good reason. It’s a spice that has been long known for it’s healing powers and supporting vitality. It supports a healthy immune system fighting oxidative stress in the body. High in curcumin, a compound that fights free radicals and helps reduce inflammation. Kale is an incredibly effective anti-inflammatory food, potentially preventing and even reversing these illnesses. Beets are a source of phytonutrients called betalains. Betanin and vulgaxanthin are the two best-studied betalains from beets, and both have been shown to provide antioxidant, anti-inflammatory, and detoxification support. Walnuts are the richest source of omega-3 fatty acids and also known ti aid in reducing inflammation and aiding in recovery. Olive oil is also loaded with powerful antioxidants and is been noted to fight inflammation and help protect your blood cholesterol from oxidation. It’s one of my favorite healthy fats. Garlic has been used for centuries for medicinal and anti- inflammatory properties to help the immune system. Apples contains anthocyanins, antioxidants that reduce inflammatory responses as I mentioned. Plus there is the age old saying an apple a day! Again I’m not a doctor or a dietitian but I do my research and try to pack in as much whole food nutrition, superfoods, and anti inflammatory foods as part of a healthy balanced life and to aid in post workout recovery when I need it like when I’m under the weather. There aren’t any miracle foods but any way I look at it I can’t go wrong with healthy whole food nutrition. 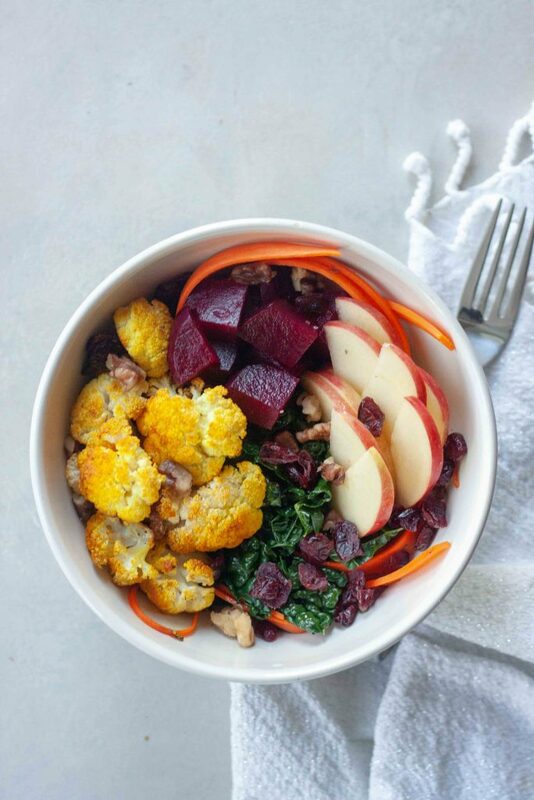 Anti- Inflammatory Buddha Bowls 2.0 are packed with whole food nutrition, texture, flavor that tastes good and good for you! 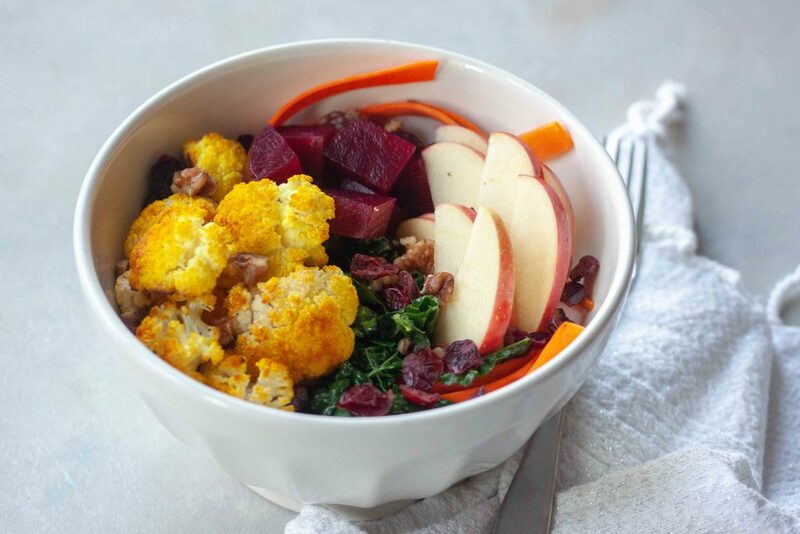 Full of anti-inflammatory benefits this bowl is plant-based, gluten free, and vegan. Preheat oven to 425F. Line a rimmed baking sheet with foil, spray with coconut or olive oil and set aside. In a large bowl toss cauliflower with olive oil. Sprinkle in turmeric and toss. Spread cauliflower on baking sheet and sprinkle generously with sea salt and pepper. Bake cauliflower for about 30 minutes, checking at 20 minutes. When your cauliflower is just about done heat a large skillet or fry pan with a little coconut oil spray or a small drizzle of oil over medium heat. Add in kale and toss until it just starts to wilt and grate in garlic. Add carrot ribbons and toss to coat. Remove from heat and divide kale mixture among bowls, top with roasted turmeric cauliflower, beets, apples, cranberries, and walnuts. Top with balsamic vinegar or turmeric dressing if desired. Enjoy! I’m glad to hear that’s you are feeling better! That’s never great when you are under the weather. Your apple picking trip sounds like a lot of fun. I used to eat at least 1 apple a day for a long time but I’ll admit it’s been awhile since I last ate one by itself and not in part of a recipe. I’ve aleaya eaten the skin bc it’s a great source of fiber too! Thank you! Still not 100% and was hoping to get back to barre today but not going to happen. Apples are so good this time of year and one of my biggest cravings right now. Not sure if it’s the pregnancy or just how things are this year. It’s been hard not to eat an apple, have it in dinner/lunch, and in my favorite breakfast/snack lately where I chop up an apple and add a little yogurt and lots of pecan granola. Tastes just like apple crisp. Oh and then there are apple desserts. I’m going to try your apple oatmeal this week to switch things up. Mine too! Love turmeric roasted cauliflower and happy to be able to enjoy it again. Wow! What a healthy lovely recipe. You have some creativity. Just can’t wait to try this. Thanks for sharing.Love this. This really looks mouthwatering! 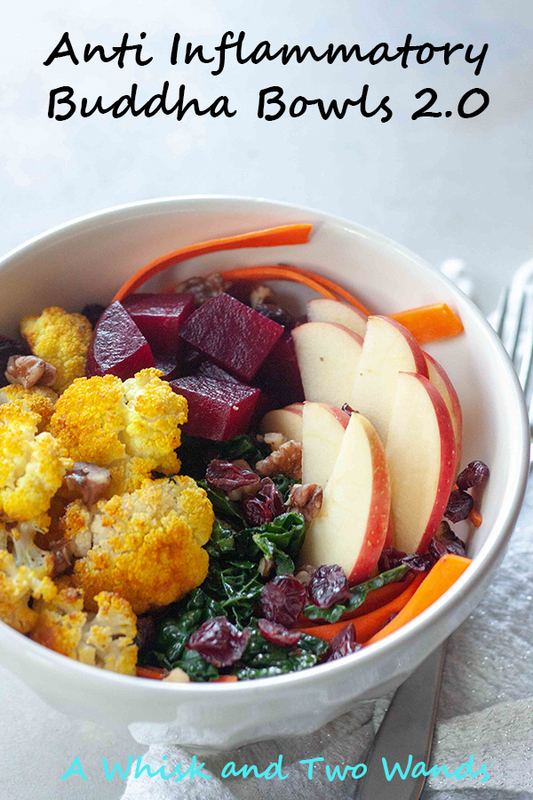 I can almost taste it right now 🙂 My family is all about the bowls right now and this is next on my list…even with the beets! 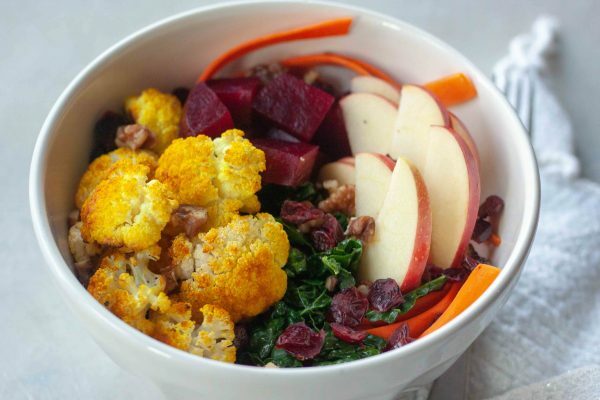 Jules Shepard recently posted…Your New Year New Gluten Free Lifestyle!